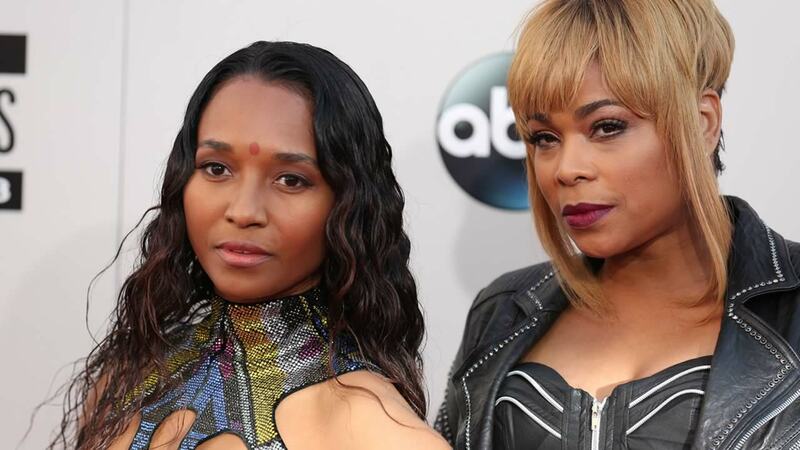 PEORIA, Ill. (WLS) -- T-Boz, one of the members of singing group TLC, has angrily taken to social media, saying the fatal shooting of her mentally ill cousin by Peoria police was unjustified. Peoria police say a bank robbery suspect was shot and killed amid gunfire from officers after an hours-long standoff. Peoria County Coroner Jamie Harwood says that 25-year-old Eddie Russell Jr. was pronounced dead at about 5 p.m. September 20 at the man's family home. The (Peoria) Journal Star reports that Peoria Police Chief Jerry Mitchell says Russell was shot when police officers fired after Russell exited the home and advanced toward police while holding a raised handgun. The coroner and police chief pledged their offices' cooperation with an Illinois State Police investigation into the death. The officers involved will be placed on administrative leave pending the outcome of the investigation. The victim's father, Eddie Russell Sr., said police grabbed his son out of the house. Mitchell disputed that statement. "My Cousin Was Shot 18 Times Including the Face and Back of His Head!" T-Boz wrote on her verified Instagram account Sunday. "He Harmed NO ONE EVER! He Had Mental Health Issues AND THE COPS KNEW THAT! Anything he's ever Done Was minor and NON VIOLENT! Eddie Russell Jr -A Human-Being -A Son- Brother-Friend-Nephew - Cousin-HUMAN! The cops told his mother to call him out on a bullhorn... USED her saying "WE WILL GIVE HIM THE HELP HE NEEDS" and He Came Out Because He Heard His Mother and They used beyond excessive force to gun him down also with heavy artillery used in warfare! 18 times? Shot eighteen times???" On her verified Twitter account, Tionne "T-Boz" Watkins posted a picture of her cousin during the bank robbery, questioning whether he had a gun. "Now the question is did he have a gun? You tell me because I've never seen a gun like that before," she wrote Sunday. "The handgun Russell was armed with during the shooting incident matches the description of the gun he used during the Bank Robbery at First Mid-Illinois Bank & Trust. The handgun was recovered at the scene of the shooting incident," Peoria police wrote on their Facebook page. "They blocked everyone off including neighbors at a 4 block radius including his mother and father and family!People could NOT go home! So no camera phones accessible is that why? COPS DIDN'T HAVE ON BODY CAMS now isn't that convenient!" T-Boz continued in her Sunday Instagram post. "They Lied and told family members Eddie Jr was at the hospital to get them away from the house knowing he was dead outside the house where they killed him! They kept his BODY OUTSIDE ON THE GROUND FOR MANY MANY HOURS! First they reported he ran out shooting =LIES! Then one cop shot =LIES! Then 5-6 shots =LIES! Then 5-6 cops shot YEAH CLEARLY! But why SO MANY TIMES? Why THE AR15? They didn't even wait for the negotiator to arrive or is it that the negotiator took his time getting there? They haven't Even Gave my cousin the RESPECT of trying to call and explain WHAT HAPPENED IN DETAIL TO HER CHILD! He needs JUSTICE! His Mother and Father and Family need JUSTICE!!!! This wasn't a hostage situation! He didn't threaten anyone's life! This was a mentally iLL young man who needed help and should have received just that! PLEASE HELP HIS MOTHER AND SPREAD HER STORY SO SHE CAN GET THE HELP SHE NEEDS AND JUSTICE FOR HER SON!!!! His Mother Has Tried For Many Years To Get Her Son Mental Health Counseling He Needed! The system Failed Him and Her!"